These are the Indoor Pools in Shropshire other users have reported. Are you a local and your pool is just not listed? Contact us to ADD IT. It's absolutely free! Swimia.com has one of the most up-to-date database about Swimming Pools. Swimia.com needs your feedback to ensure all the details is valid, since maybe this pool is no longer open to the public. Please contact the facilities to check which activities are offering and their timetables. Most on the Indoor Pools in Shropshire give both open lanes for independent swimming and also guided activities like water aerobics or aquabike. Regular users told us essentially the most necessary factor of swimming is always to control your breathing. To get this, our head will need to be aligned with our spine all the time. Without a shadow of a doubt, swimming in Hadley is the most effective strategy to unwind right after perform. Take a couple of minutes to browse Swimia's catalog to find a Pool in Hadley. It's difficult to visit Shropshire devoid of dropping by Shrewsbury (with 69.519 residents). 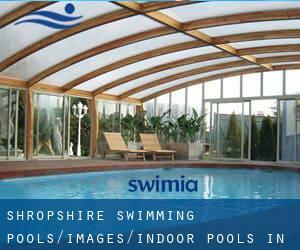 Currently Swimia is showing you all the Swimming Pool in Shrewsbury and the closest pools situated in its vicinity. Swimming is usually a exceptional thought to keep your body active for the duration of your visit to Oswestry (Shropshire), or even should you be a local. 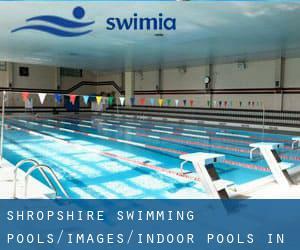 Swimia helps you to find your closest Swimming Pool in Oswestry. Holding an estimated population of 16.093, Ryton is among the most important cities in Shropshire. Check all the Swimming Pool in Ryton and its surrounding area. St. Lawrence C of E Primary School , Shrewsbury Road , Church Stretton , England , UNITED KINGDOM (Postal Code: SY6 6EX). Swimmers like you reported 20 meters x 7 meters, 4 lanes, 1 meters - 2.5 meters depth, 1 meters - 2.5 meters depth, Indoors. Phone number and e-mail address are number for this Swimming Pool. William Brookes School , Farley Road , Much Wenlock , England , UNITED KINGDOM (Postal Code: TF13 6NB). This sports center delivers 25 meters x 12.5 meters, 6 lanes, 0.9 meters - 2.1 meters depth, 0.9 meters - 2.1 meters depth, Indoors. For this Swimming Pool, only phone number is number here. Brampton Rd , Bishops Castle , England , UNITED KINGDOM (Postal Code: SY9 5AY). Swimmers like you reported 20 meters, 4 lanes, Indoors. Phone number and e-mail address are number for this Swimming Pool. Sundorne Road , Ditherington , Shrewsbury , England , UNITED KINGDOM (Postal Code: SY1 4RG). Swimmers like you reported 20 meters x 6 meters, Indoors. Unfortunately we do not have the email address of this Swimming Pool, but we can give you the phone number. Shrewsbury Road , Owestry , England , UNITED KINGDOM (Postal Code: SY11 4QB). Swimmers like you reported 25 meters x 12.5 meters, 5 lanes, Indoors. Unfortunately we do not have the email address of this Swimming Pool, but we can give you the phone number. White Lion Meadow off Bridgewater Street , Whitchurch , England , UNITED KINGDOM (Postal Code: SY13 1BA). Swimmers like you reported 25 meters x 9 meters, 5 lanes, 1 meters - 3 meters depth, 1 meters - 3 meters depth, Indoors. Unfortunately we do not have the email address of this Swimming Pool, but we can provide you with the phone number. Bowens Field , Wem , England , UNITED KINGDOM (Postal Code: SY4 5AP). Swimmers like you reported 20 meters x 8 meters, 4 lanes, 1 meters - 2 meters depth, 1 meters - 2 meters depth, Indoors. Phone number and email address are number for this Swimming Pool. Newtown , Market Drayton , England , UNITED KINGDOM (Postal Code: TF9 1JT). This sports center offers 25 meters x 13 meters, 6 lanes, 1 meters - 1.8 meters depth, 1 meters - 1.8 meters depth, Indoors. For this Swimming Pool, only phone number is number here. Updated on 2019 Priory Road , Shrewsbury , England , UNITED KINGDOM (Postal Code: SY1 1RU). This great and large sports center lets professional swimmers like you enjoy 33.3 meters x 12.8 meters, 6 lanes, Indoors. Additionally, within these facilities you can try 25 meters x 10 meters, 4 lanes, Indoors. Phone number and e-mail address are number for this Swimming Pool. Bromfield Road , Ludlow , England , UNITED KINGDOM (Postal Code: SY8 1DR). Swimmers like you reported 25 meters, 6 lanes, Indoors. Phone number and e-mail address are number for this Swimming Pool. Meole Brace Golf Course , Oteley Road , Meole Brace , Shrewsbury , England , UNITED KINGDOM (Postal Code: SY2 6QQ). Swimmers like you reported 20 meters x 8 meters, Indoors. Unfortunately we do not have the email address of this Swimming Pool, but we can give you the phone number. Bridgnorth Endowed School , Cliff Road , Bridgnorth , England , UNITED KINGDOM (Postal Code: WV16 4ER). Swimmers like you reported 25 meters x 10 meters, 4 lanes, Indoors. Unfortunately we do not have the email address of this Swimming Pool, but we can give you the phone number.